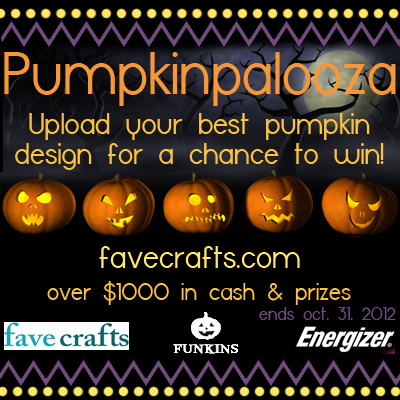 Home > Most Popular Crafts > Pumpkinpalooza Pumpkin Decorating Contest Finalists! Pumpkinpalooza Pumpkin Decorating Contest Finalists! If you've been waiting in anticipation for our Pumpkinpalooza pumpkin decorating contest winners, the wait is over! These were the top three original designs as voted on by you! Elaine Lasseter for this wood grain pumpkin! Stephanie Joseph for this candy corn cat pumpkin! Mallisa Quitmeyer for this witch carved diorama pumpkin! Congratulations to the winners! Thank you and great job to everyone who entered the contest and we hope to see what you come up with next year! Our panel of craft-lebrity judges picked their favorites and we narrowed it down to the top 10! Now it's up to you guys to help up pick the first, second, and third place winners! Scroll down to see the top ten picks and then brush up your judges skills because you can only vote once so you really want to make it count. See your pumpkin in the lineup? Tell all your friends to support you and give you a vote. 1st Prize - $400 cash prize and Energizer Flameless Candles valued at $100. 3rd Prize - $150 cash prize and Energizer Flameless Candles valued at $100. Voting starts on October 25th and ends on October 30th at 11:59 CST. Winners will be announced on October 31st. I hope chris rowsell win his is really good. Why are you so mad, you winning? Most of us know your "lovely carved pumpkin" is ceramic. Make sure to thank the dollar store you got it from. Well since I have no employees that threat really wasn't thought out. All though it did make me laugh. I don't like being called a cheater. We all need to remember "if you ain't got nothing nice to say don't say nothing at all "
It's so obvious 1 and 4 are ceramic!!!! Number 3 oh wow, paper eyes and cigar cleaners..Oh so original ...This site is sad to say the least! This was a bull contest! Number 7 and 8 got the point of the contest the rest uh sure thing, more like better homes and garden!!! My pumpkin is a real pumpkin not ceramic, not styrofoam...REAL!! The rules state that it had to be a pumpkin. Real or artificial. Just saying. All the entries were awesome. I am positive the only one commiting "VOTERS FRAUD" is Elaine Lasseter!! 117 Votes overnight??? What a JOKE! How can you do voter fraud when you can only vote once? I wonder how much Elaine paid for all of her votes. People like you ruining voting contests for others who REALLY worked hard to try and win. I hope you get caught and disqualified!! Just to let everyone know I have not paid for votes. I hand drew the stripes on my pumpkin. Everyone who has seen me working on the one I am making for the little girl next door loves it. I have not paid for votes but have asked my friends to vote for me. um, how do I vote? I like the carriage one by Ben sanchez! Come on, guys...is the cat really in the number one spot right now? As an independent observer to this competition, I think we can all agree that the cat would be a long-shot, at best. I'm starting to question the integrity of this "Stephanie Joseph". Now look, I'm not saying that Stephanie Joseph is participating in some sort of "get out the vote" fraud, but I think we should all take a close look at the voter rolls. I wouldn't be surprised if we saw votes from Jimmy Hoffa and Abe Lincoln... I think it's pretty clear that pumpkin #7, by Chris Rowsell, is the clear winner here. This museum-worthy piece displays an intricacy and craftsmanship that is second to none. Let's ask ourselves, "What are these pieces saying about society?" When you look at #7, the message is clear. Come October 31st, I will accept no result other than contestant #7 in a landslide decision. It was the top 20 that were to be picked.... I know I read that. cool contest, just sad that someone things they can google pumpkin carving, post a picture of a Ray Villafane's Predator pumpkin and think no-one will notice. If you are going to cheat, at least cheat better and go to page 2 or 3 of a google image search. If number 28.Kat is in fact Ray, come on ray, post one of you new pumpkins for us to drool over. I agree...hopefully the judges see that some are a copy of someone elses artwork!! @smartpart 57 Thanks for your concern. All submissions were fact checked by our editors and anyone caught "cheating" was eliminated from the competition. All our finalists are the real deal! Roseanne Halloween specials were my favorite! Yeee gippy!